May 15-19 is National Infrastructure Week. Across America, leaders and citizens around America will highlight state of our nation’s infrastructure — roads, bridges, rail, ports, airports, water and sewer systems, the energy grid, and more — and encourage policymakers to invest in the projects, technologies, and policies necessary to make America competitive, prosperous, and safe. In support of this national week of awareness, Gov. Kay Ivey has proclaimed May 15-19 also be Infrastructure Week in Alabama. 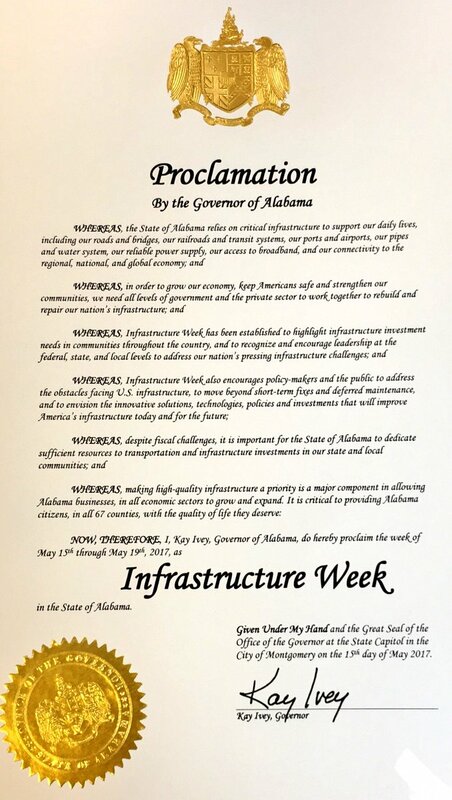 NOW, THEREFORE, I, Kay Ivey, Governor of Alabama, do hereby proclaim the week of May 15th through May 19th, 2017, as Infrastructure Week in the State of Alabama.